These spines have all the features of the Classic Spine Series but also have has a sacral opening and exposed brainstem for advanced studies. Other features are full pelvis and occipital plate, fully flexible mounting, L3-L4 disc prolapsed, spinal nerve exits, cervical vertebral artery, and cauda equine. Stand is not included. last spine you will ever need comes with a lifetime warranty. Features male pelvis, occipital plate, vertebral artery, spinal nerve exits and a dorsa lateral disc prolapse between the 3rd and 4th lumbar vertebrae. Specially mounted on a flexible durable hose providing extra stability. Idea for regular active use, such as in schools. Stand is not included. 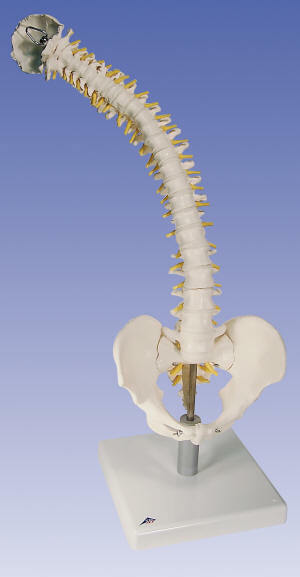 This unique spine has soft discs to show disc deformation during normal and abnormal positions. 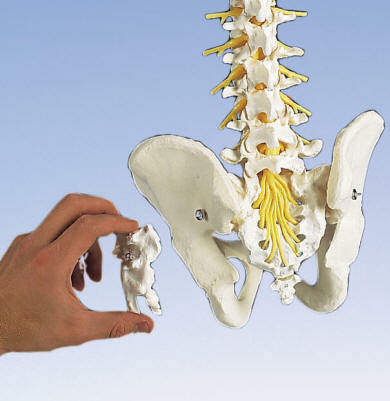 Use it to demonstrate any number of pathological conditions, such as scoliosis, lordosis, kyphosis or subluxations. Herniation can be demonstrated with compression. In addition, the special mounting allows unobstructed viewing during demonstration and display. Includes spinal cord and spinal nerves. Comes with removable stand.